If you have been invited to stay at a friend’s house or cottage for a few days there are definitely some rules of etiquette you should follow in order to be a good house guest. As a rule of thumb it is always appropriate to bring some kind of gift for the house when you arrive. This can be flowers, a centerpiece for the table or a bottle of wine. Chocolates, a picture of some sort in a frame or an item for the person’s garden is also usually appreciated. This gives your host a keepsake that will help remind him or her of your visit. A jar of homemade jam or cookies you have made also makes a nice gift. Make sure the gift is appropriate. For instance, do not bring a jug of sugary lemonade to a diabetic host’s home. Before you enter a home always ask if you should take off your shoes. This is not mandatory in most homes but the offer to remove them is a sign of honor and respect for your friend in many cultures. Remember that being someone’s house guest is not the same as being in a hotel. There are no maids and you will be expected to clean up after yourself. Making your own bed, picking up after yourself and wiping up spills in the bathroom is expected. To impress your hostess make your bed as neatly as possible. Be sure to throw any towels you have in a laundry hamper. Do not leave anything in a heap and make sure that all of your clothes are hung up and not draped over the bed or chairs. To be a good houseguest you should also ask permission before you use any major appliance or tool in the home including the washer or dryer, dishwasher or vacuum cleaner. If you do end up borrowing something from your host (like a blow-dryer) you should always put it back just as you found it. This is especially important because sometimes appliances are finicky or even dangerous to use because they are broken. It is also polite to offer to do simple chores for your host such as set the table, dry the dishes or sweep the floor. Offering to take care of these little tasks can go a long way to getting you invited back to your guest’s home for a second visit. It is also a lovely gesture to send a thank-you card back to your host to show them how much you appreciate their invitation. Be sure to send it by mail and not by email — before you know it you will be invited back! Wind chimes look beautiful and sound beautiful. They are manufactured from every material imaginable now so there is a type of wind chime to suit every type of personality. One thing that is even more important than how a wind chime looks is to consider how it sounds. Like anything you buy there are both high quality and low quality wind chimes. If amazing acoustic noise is important tan you might want to go for a high quality set of piano type wind chimes that are made of brass, nickel, aluminum or a metal alloy. These types of wind chimes hang in a lateral way and are constructed out of hollow tubes. Each tube has its own unique tone that harmonizes with the rest. You can get these in versions that are as large as organ pipes or as tiny as a kid’s piano. . If the gift is for a child then you can buy all kinds of wind chimes that are made from many kinds of interesting materials including precious stones, metals and plastic. Many of the plastic versions feature translucent cartoon characters or happy motifs that are meant to knock together in the wind. You can even buy wind chimes that you can wind up or plug in so that they rotate over a baby’s cradle. If you need a gift for a nature lover then get wind chimes made out of natural materials such as petrified wood, or sea shells. Wind chimes made out of agate slices have a particularly pleasant sound. If the person you are buying the gift for is really into Feng Shui cures then you can’t go wrong getting them a set of wind chimes that are made from hollow flumes of bamboo. When they clank together these bamboo rods make a particularly pleasing sound. They are also an ages old cure for dispersing bad energy. Wherever they are hung in the home they are bound to improve the auspiciousness of the area that the area symbolizes. For instance, bamboo chimes hung in the center of the home can go a long way to dispersing stagnant chi (energy) to do with health as the center of the home symbolizes the health sector. A good gift to get yound adults is a gift that can use their mind and creativity. Like this Drawing Gift Kit. The The core of our set is the Cretacolor Teacher’s Choice Advanced Tin Set of 27. 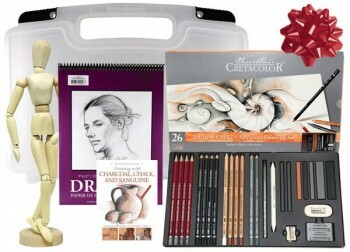 This set was developed in conjunction with over 500 art teachers across the US that specified the best assortment of products for a beginning drawing student. The Cretacolor Teacher’s Choice Advanced set features an incredible assortment of graphite, charcoal, flesh tone pencils, a kneaded eraser, soft vinyl eraser, blending stump, metal sharpener and sandpaper for detail sharpening. All of these great items are included within a sturdy and portable tin case. It can’t be a drawing set without a nice sized, good quality drawing pad. So, it includes the best selling, Richeson 9″ x 12″ pad, which is made up of 24 sheets of excellent quality, heavyweight, 80 lb., acid free drawing paper. For inspiration it also includes a 12″ manikin, perfect for doing figure studies, and Barron’s Art Guides Drawing with Charcoal, Chalk, and Sanguine Crayon, a really great book that will teach the fundamentals of drawing all bound in a hardcover that will last for many years of use. Men love bacon. So, here are two great gift ideas for you man. First, this Sizzling Supreme Basket is so delicious, it’ll make him smile, and make his taste buds dance with joy. 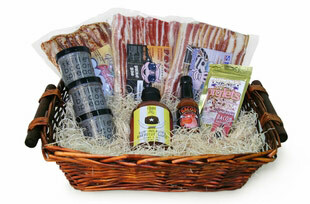 This bundle contains a package of Sun Dried Tomato bacon, Hickory Smoked bacon, and an Applewood smoked bacon. Three kinds of bacon that will make him do that “happy food dance” when he eats it. But it doesn’t stop there: A Rum Molasses BBQ sauce, bacon hot sauce, bacon pecan piglets, bacon flavored Toothpicks, and THREE bacon skillet spreads finish off this basket of awesomeness. Oh wow, bacon skillet spread? Spreadable bacon? Get it now! Second we have the Bacon of the month club like the Hickory Smoked Peppered Bacon Club This Bacon truly is magical pork! 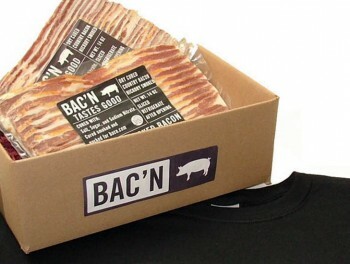 Unlike other bacon – Bac’n bacon doesn’t shrink while cooking. You’ll need to see it to believe it!